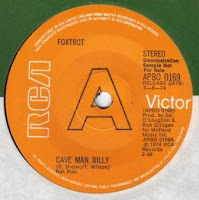 Cave Man Billy is one of the many Glam Era Bubblegum Obscurities released on RCA at the time. It’s a silly yet compelling tune with a nice Fuzz part and Sweet–like vocals. It recalls a more frothy Neanderthal Man and is another pure Bubbleglam delight. There are quite a few cheap copies if this single floating about online, so happy hunting! 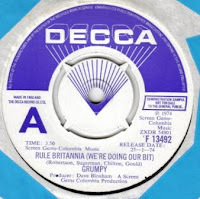 Rule Britannia is a fun period piece and a great ode to the 3 day week, full of the Dunkirk spirit with a wink to Confessions Of A Window Cleaner... it certainly gives The Strawbs’ Part Of The Union a good run for its money. The lyrics are a real hoot and musically it comes across like a Vaudevillian Kinks in bovver boots. Dave Bloxham produced this, he was mainly known for Reggae stuff although he also produced that first Ducks Deluxe album. Geoff Appleby had a long career starting off with The Rats (the Hull Rats, Geoff joined at the same time as Mick Ronson). He was also a member of the Hunter-Ronson Band and released two singles on Virgin under his own name before reappearing as Buzz with the singles The Rock Roller Coaster and Mony Mony which were only released in Germany. 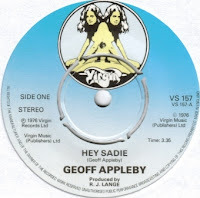 Hey Sadie is Geoff's second Virgin single and it's a cracker. It's a late rockin' Glam track with a killer sense of melody. The arrangement is ambitious and as with the Buzz singles, Hey Sadie is produced by Robert "Mutt" Lange. The sound is full, bright and very loud making the whole package sound like a great lost Mott The Hoople single. The Killer is Jans Rietman, who was the piano player with Long Tall Ernie and the Shakers. He also joined Bonnie St. Claire & Unit Gloria, as the band was on the verge of breaking up (he’s on the sleeve of Knock on my door). His real claim to fame is when he produced the Jet Boy Jet Girl 45 by Captain Sensible & The Softies back in ’77 ! Thanks to Jos for the background info and to Tim for turning me onto the track in the first place.